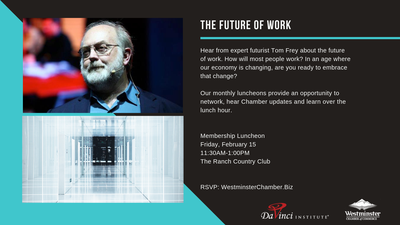 Join us for our monthly luncheon and hear from renowned futurist speaker Tom Frey. This monthly program features an update on Chamber, welcome for new members and an opportunity to learn about a business topic you can take back to implement in your business. If you are intersted in hearing from a powerful keynote and mingling with other professionals, click the register button above.